Simple elegance. Asus wants to meet the growing expectations of business customers with new features and more performance for the AsusPro Advanced B8430UA. The basics are covered with a ULV processor, sufficient memory and a fast SSD. 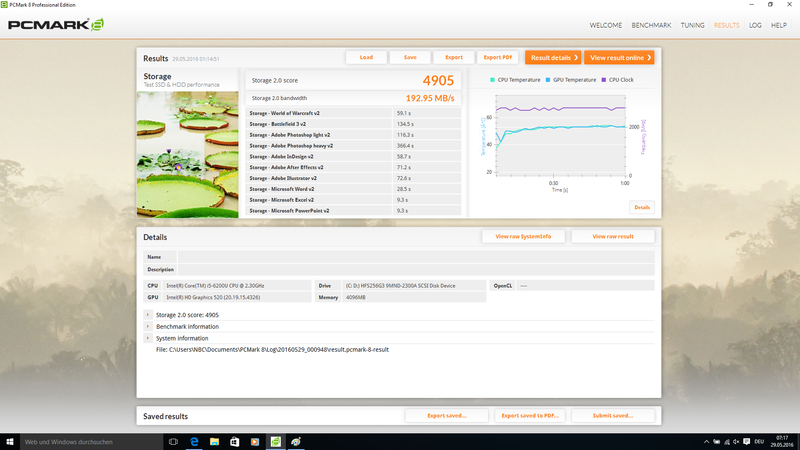 Read our review to find out how the AsusPro Advanced B8430UA works in practice. 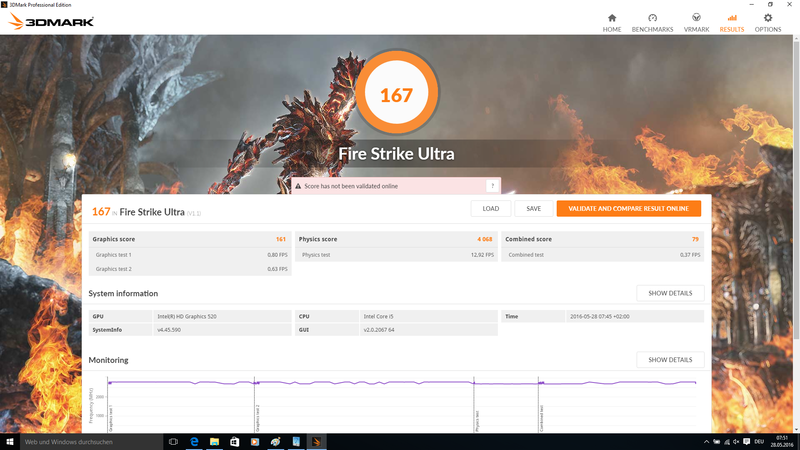 Asus wants to continue the success of the AsusPro Advanced BU401LA, which got a good rating in our review, with the new AsusPro Advanced B8430UA. 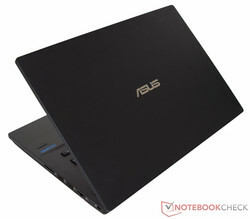 There are many rivals in the 14-inch segment, but Asus wants to convince with good quality for a comparatively low price. The lowest price for the device was 930 Euros (~$1049) at the time of writing, so it is clearly below the 1,000 Euros mark (~$1128). The configuration includes an Intel Core i5 processor with the integrated Intel HD Graphics 520, 8 GB DDR4-RAM in a dual-channel configuration, a 256 GB M.2-SSD as well as a matte Full HD panel. All the components are inside an elegant and sturdy chassis, and the design reminds us of the predecessor. Asus does not offer other CPUs so far, so the various SKUs only differ in terms of memory and storage (SSD/HDD). We only use 14-inch devices for the comparison to show the performance level in this segment. 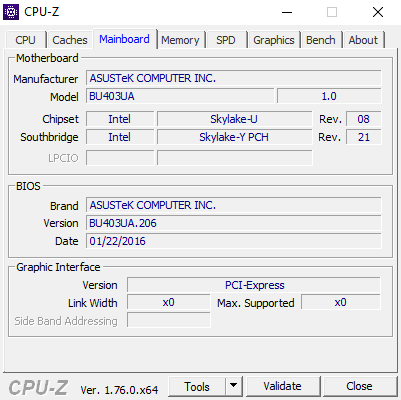 All current devices have modern Skylake CPUs from Intel. We will also include the predecessor in our tables, so you can easily compare the two. The AsusPro Advanced BU401LA was still equipped with a Haswell CPU. The current AsusPro Advanced B8430UA is very similar to its predecessor. There are hardly any visual changes and the materials do not differ, either. Matte-gray surfaces and sharp edges are dominant – typical office design. Our review unit tips the scale at just 1.6 kg and is thin at a height of just 21 millimeters. The stability is good, despite the low weight. The matte surfaces are smooth and easy to keep clean. The thin aluminum design is pressure resistant and the stiffness reduces the susceptibility to twists. We can only dent the base (~2 mm) in the center above the keyboard. Concentrated pressure on the lid creates slight ripples on the screen. The base is sturdy and cannot be twisted. You can slightly twist the lid at the sides, but it is still okay. 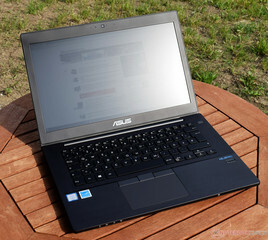 The notebook is extremely reliable according to Asus and even surpasses the military standard MIL-STD 810G. The AsusPro will survive twice the height compared to regular notebooks in the drop test, and the lid is supposed to withstand 20% more pressure. The hinges were opened and closed 20,000 times in a long-term test. The keyboard can survive 120 ml of fluids without damage. We are convinced by the material combination consisting of plastic and aluminum, and there is no criticism for the tactile feeling, either. The sturdy hinges reduce bouncing to a minimum, but it is still possible to open the lid with one hand. There is no criticism for the build quality. Everything fits well, nothing clatters and there are no oversized gaps. We can still find a small problem with our test model. 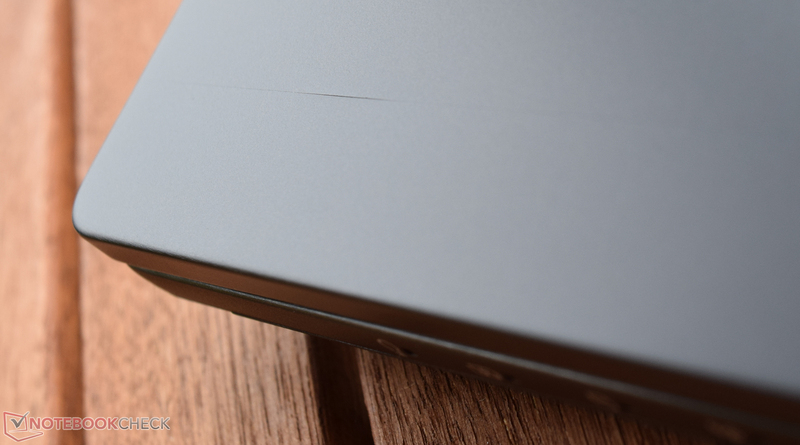 There is a small crack in the upper area of the lid, which affects the visual impression of our model. We cannot say whether this is an isolated incident or a design issue. We expect this to be an isolated incident though and not a general construction issue. We want to mention that we did not deduct points in the case rating for this crack. The port layout is sophisticated and most of the connectors are located at the sides. The only exception is the SmartCard reader, which is at the front right. Asus distributes the four USB 3.0 ports evenly and the spacing between the individual ports is sufficient. 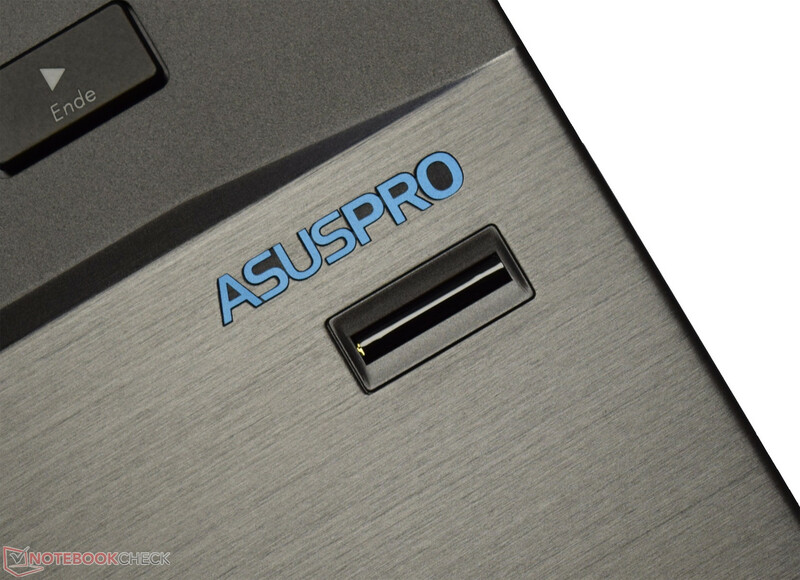 One of the USB 3.0 ports at the left side is special, because it is surrounded by two small slots for the connection with the AsusPro Ultra Docking Station. The docking station creates a clean working environment and also expands the port variety. It retails for around 240 Euros (~$270). Potential buyers have to waive an HDMI port, but the AsusPro Advanced B8430UA is equipped with a Mini-DisplayPort instead. The card reader accepts all common standards (MMC, SD, SDHC, SDXC). 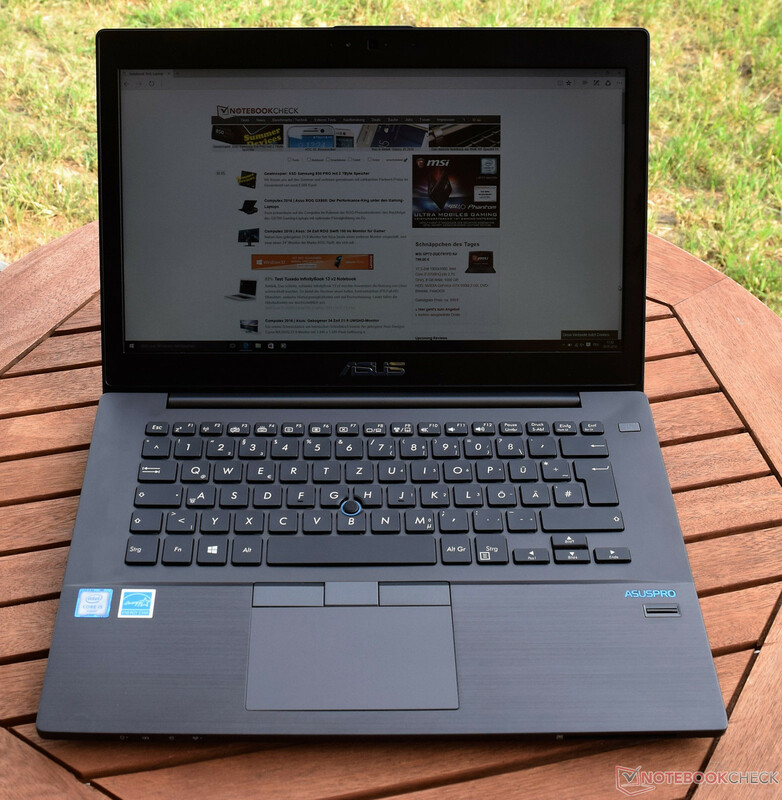 We check the performance with our reference card Toshiba Exceria Pro SDXC 64 GB UHS-II. 250 identical JPG files are copied from the card onto our hard drive, and the average transfer rate of 76.2 MB/s is pretty average. Intel's WLAN module Dual-Band Wireless-AC 8260 supports the fast 802.11ac standard as well as Bluetooth 4.2. 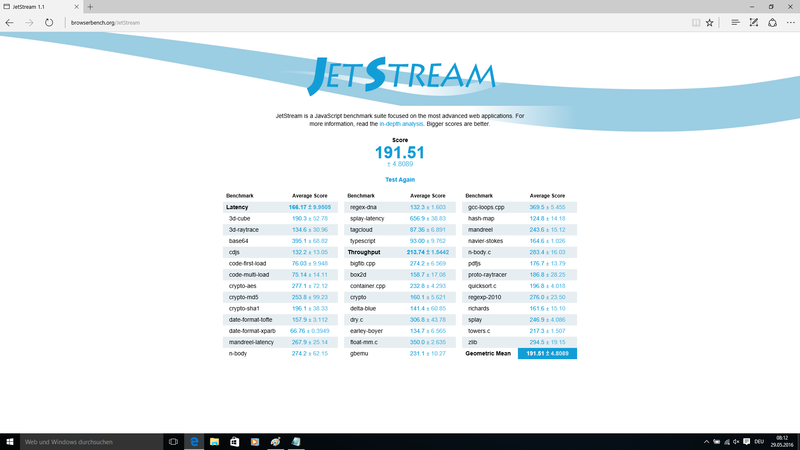 The maximum transfer rate in an ac-network (dual-stream) is 867 Mbps. 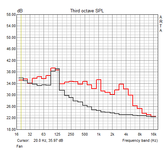 The stable connection as well as the decent range convinced in our test. We use the router Linksys EA8500 for our standardized test and determined 625 Mbps (receive) and 502 Mbps (transmit), respectively. This result is clearly above average. Wired network connections are possible via Gigabit-Ethernet port. The security package of the AsusPro Advanced not only includes the usual accessories like Kensington lock slot and a fingerprint scanner but also a Trusted Platform Module (TPM), a SmartCard reader as well as Anti-Theft. Asus also offers models with vPro support. More information about Anti-Theft is available in our dedicated article. Asus is not very generous in terms of accessories. A small 65-Watt power adapter is in the box, as well as recovery media, a warranty card and a quick-start guide. 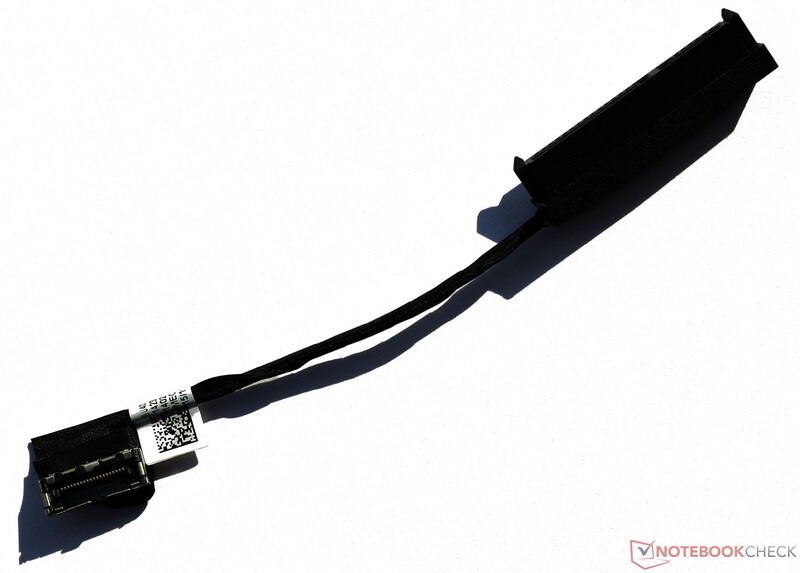 Our device was also shipped with an additional small connector cable for a 2.5-inch drive, which can be used to attach the drive to the motherboard. Models that are equipped with a 2.5-inch drive by default will probably not be shipped with an additional cable. 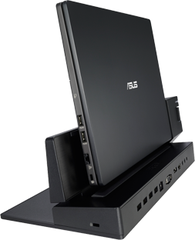 One proprietary accessory is the AsusPro Ultra Docking Station, which costs 240 Euros (~$270). 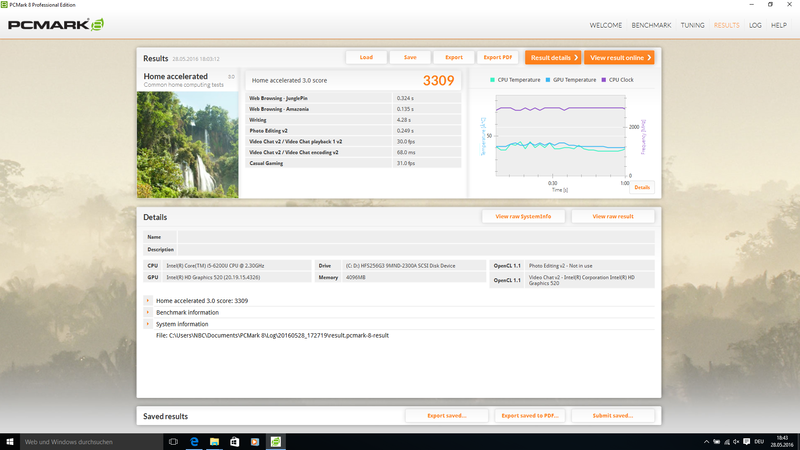 There is no unnecessary bloatware on the AsusPro Advanced B8430UA ex-works; we can't find any annoying toolbars or trial versions. The Asus Business Manager is a good tool and makes it easier to create system backups or manage network connections. 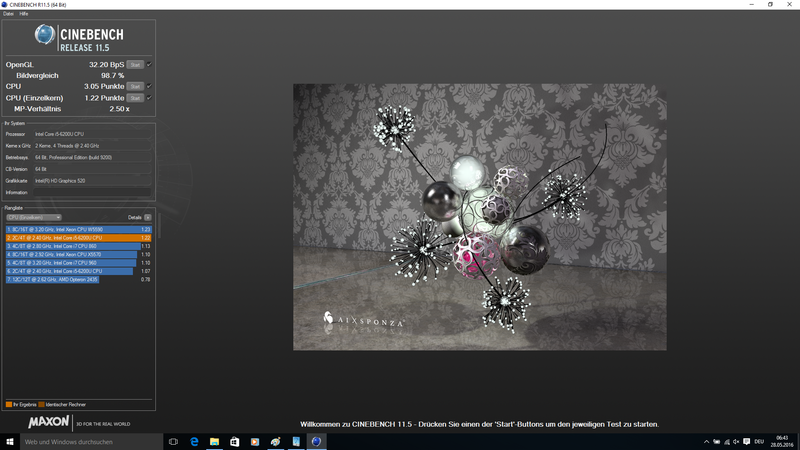 Windows 7 64-bit and Windows 10 64-bit are available in the Professional version. We recommend using the latest operating system (Windows 10 Professional) in existing network infrastructures. Thanks to the maintenance hatch, the maintenance is pretty simple. It can be removed quite easily after you loosen two screws on the bottom. After that you get access to the battery, which can also be removed without problems, as well as the M.2-SSD, the memory and the 2.5-inch slot. It is, however, not possible to clean the fan. This would require further disassembly of the device. 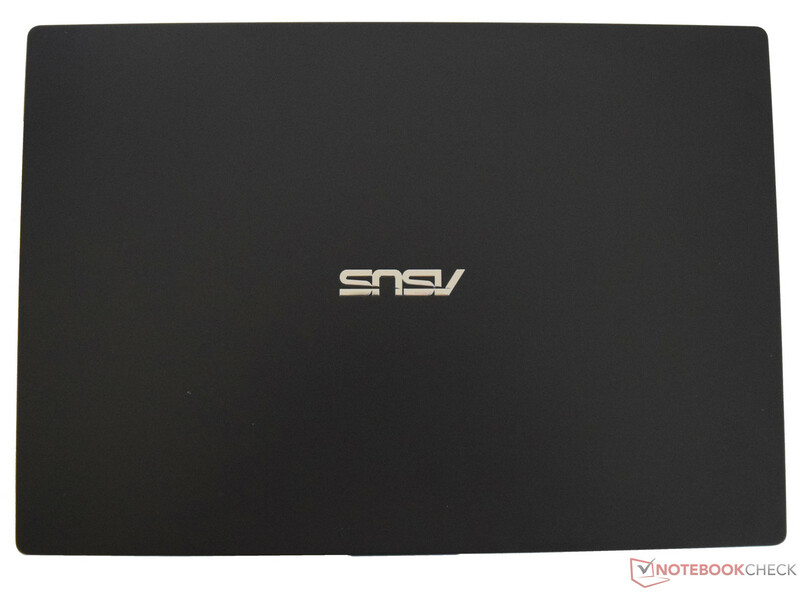 Asus grants a 24-month manufacturer's warranty for the AsusPro Advanced B8430UA, while the comparison devices from Lenovo (L-series) and Dell on the other hand are often only shipped with a 12-month warranty. The standard coverage also includes a Pickup & Return service. It is possible to extend the warranty to three years for 79 Euros (~$89). 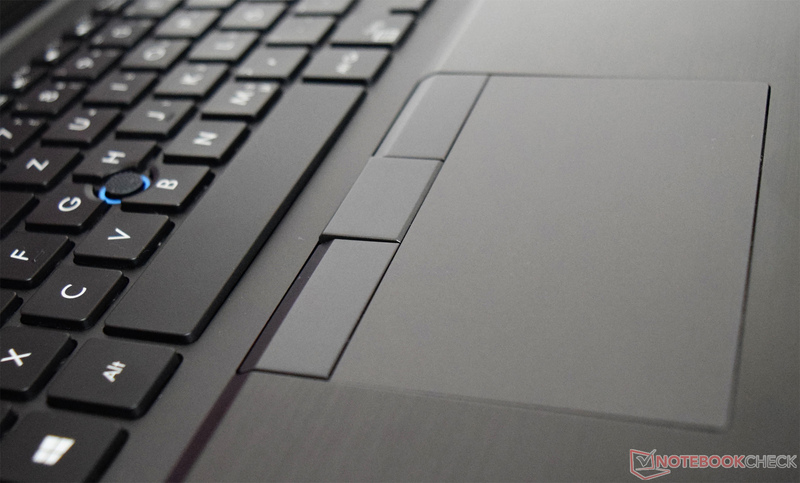 The keyboard of the AsusPro Advanced B8430UA certainly does not have to hide behind ThinkPads or EliteBooks. The generous, but not too long key travel, as well as a firm stroke create a great typing experience. However, we can notice the mechanical clattering of the 15 x 15 mm keys when you type quickly. Only the keys "B", "G", and "H" have a slightly different shape due to the Trackpoint. The spacing between the individual keys is 3 mm and they have a smooth surface. The lettering is easy to read and the overall impression is sophisticated. The subtle background illumination can be adjusted in three levels and supports typing in darker environments. Asus also protected the keyboard against liquids. The AsusPro Advanced B8430UA is supposed to manage up to 120 ml of fluid without being damaged. After the AsusPro Advanced BU401LA was not equipped with a Trackpoint, the manufacturer now brought it back for the current model. 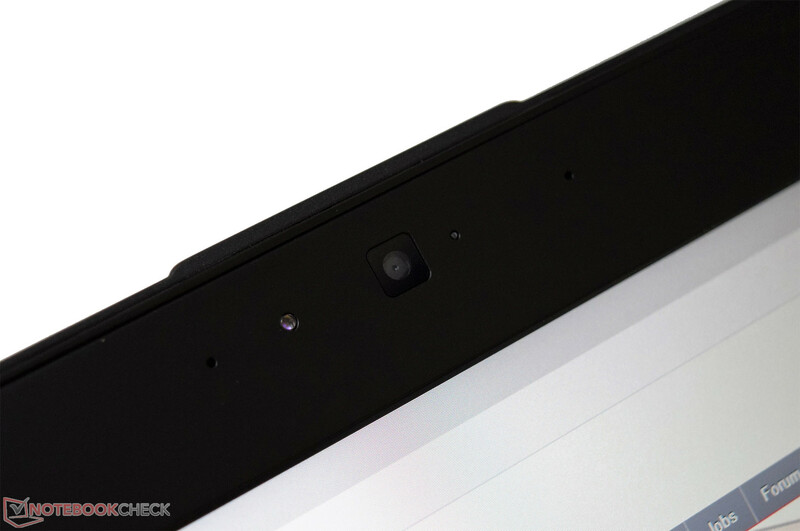 The surface of the ClickPad is pretty much identical to the predecessor at 10.6 x 6.1 centimeters. The touchpad implementation into the base is frameless and the gliding capabilities are very good. Only moist fingers can stutter a bit. Multitouch gestures with two or three fingers, as well as the automatic deactivation when you attach a mouse, work very well. This is also the case for the integrated mouse buttons. They are not too smooth, so accidental inputs are more unlikely. 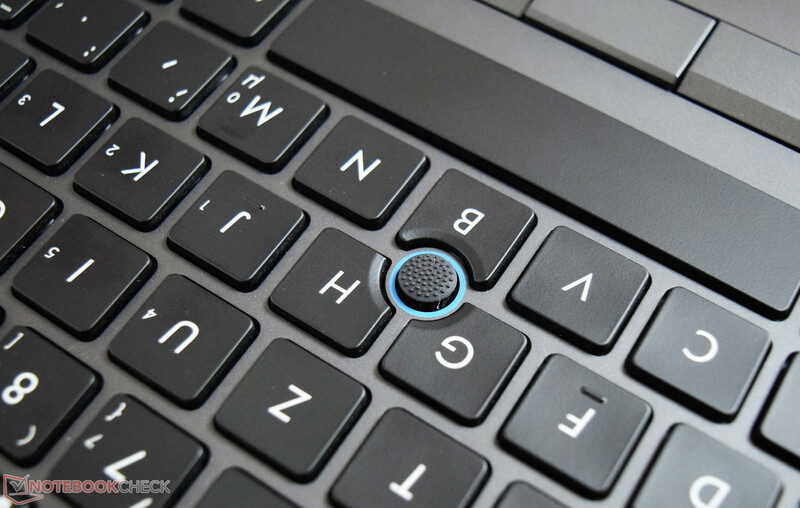 Above the surface are three dedicated buttons for the Trackpoint. The AsusPro Advanced B8430UA is now also available with a Full HD display, which was not the case for the old model. 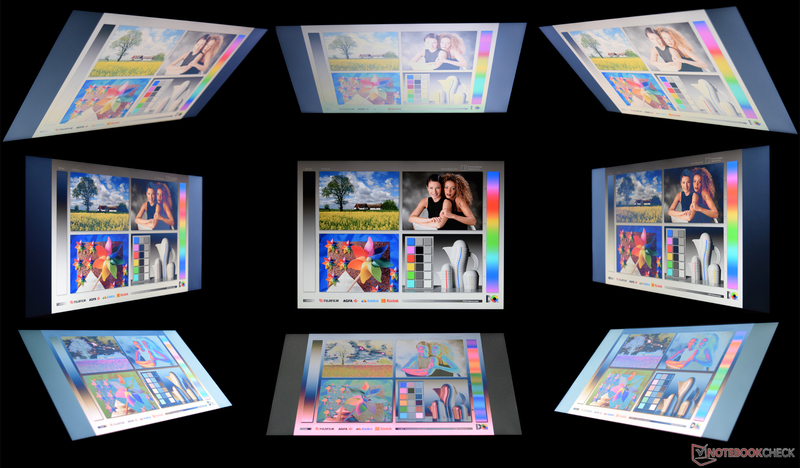 The 14-inch TN panel from Innolux manages a pixel density of 157 PPI thanks to 1920x1080 pixels. 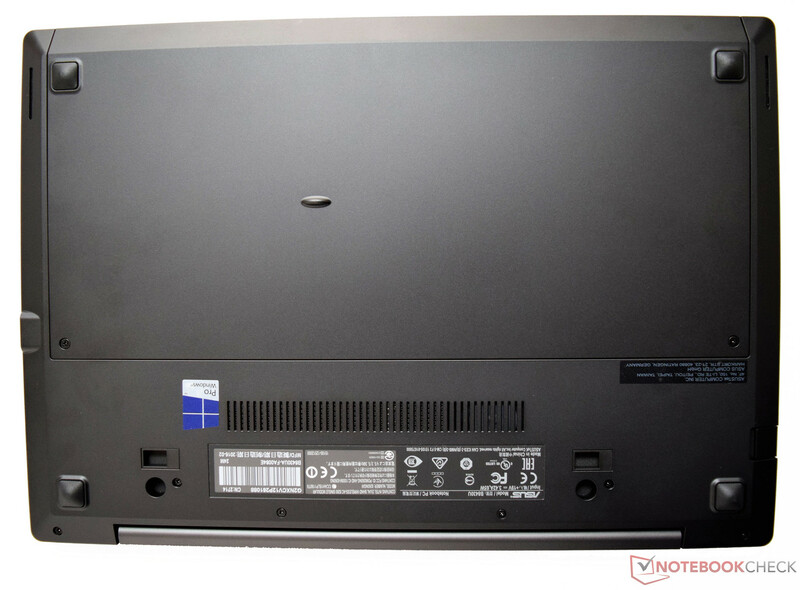 Except for the higher resolution, it is quite comparable to the TN panel of the AsusPro Advanced BU401LA. 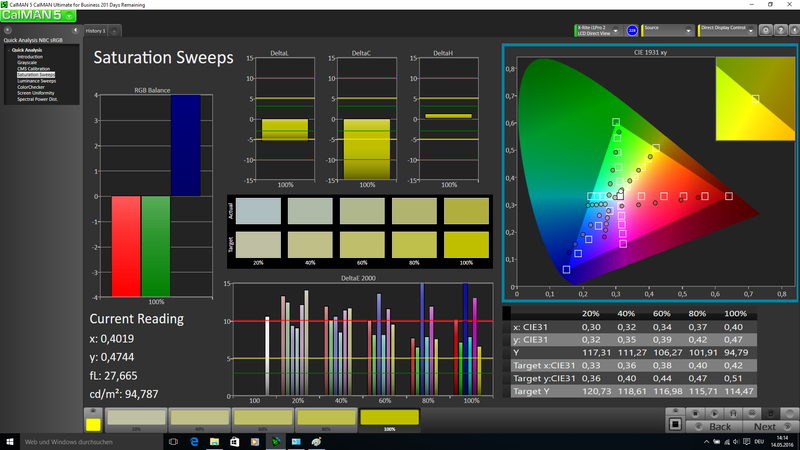 The low display brightness of just 207 cd/m² makes it hard to use in bright environments. The matte surface can prevent annoying reflections, which would affect the outdoor capabilities even further. The brightness distribution is just average at 87%. 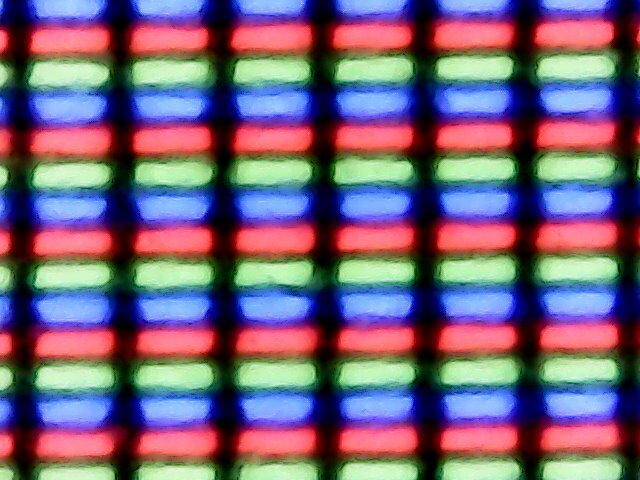 You can also notice some clouding in the upper corners and the lower half of the display on a completely black picture. This is, however, not noticeable in practice and therefore not annoying. The choice to use a Full HD panel is definitely the right one, but this particular panel can only beat the competitor from Dell (Dell Latitude 14 E5470), even though Dell also offers a Full HD screen for the Latitude. 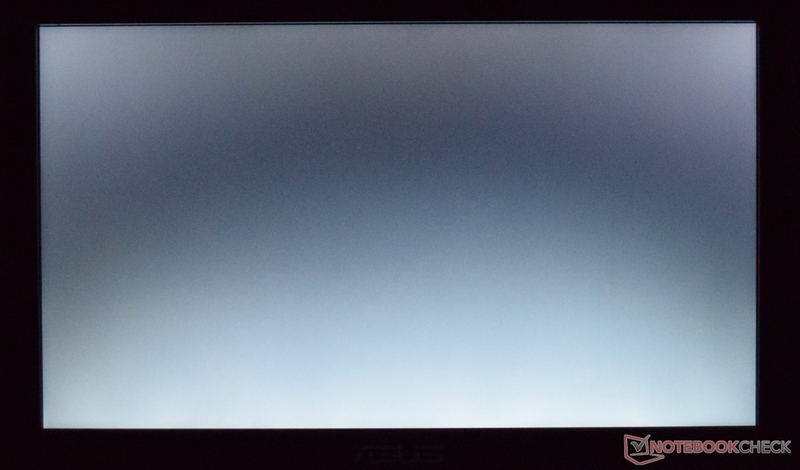 Asus on the other hand does not offer optional screens. 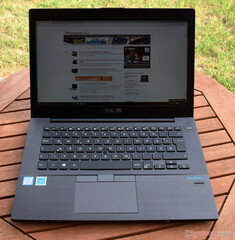 The review unit is beaten by the comparison devices from HP (HP EliteBook 840 G3) and Lenovo (Lenovo ThinkPad T460, T460s, L460). 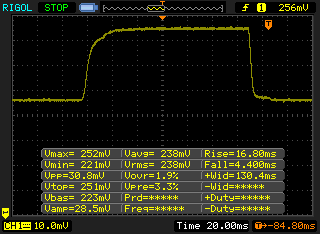 A positive aspect is the lack of PWM. The TN panel from Innolux offers a decent picture quality in general. 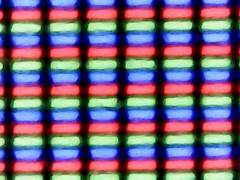 The black value (0.4 cd/m²) and the contrast ratio (525:1), however, are only about half as good compared to a high-quality IPS panel. 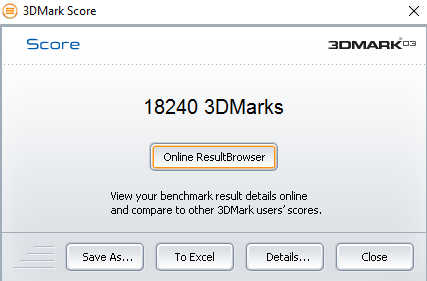 This is evident when you compare the results with the rival from Lenovo. The picture still looks good and vivid, so multimedia applications and movies are enjoyable. 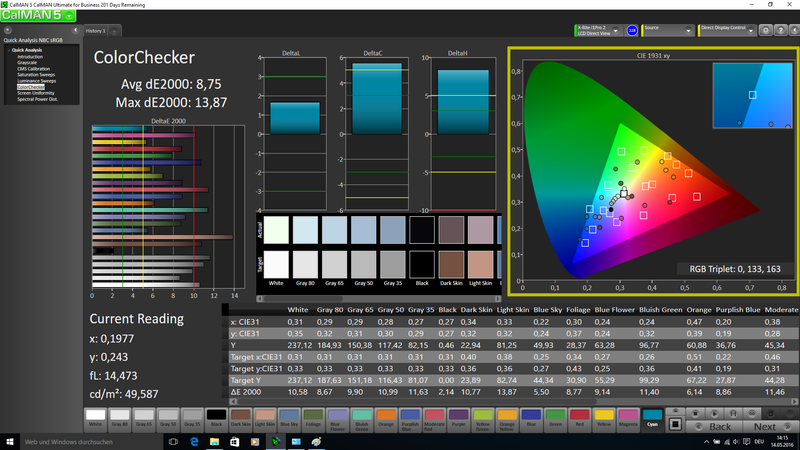 Similar to its predecessor though, the AsusPro Advanced B8430UA falls behind in terms of color accuracy and grayscale performance, which results in high DeltaE-2000 deviations. They are not in the double-digit range yet, but we can recommend a calibration. This will also reduce the visible blue cast. 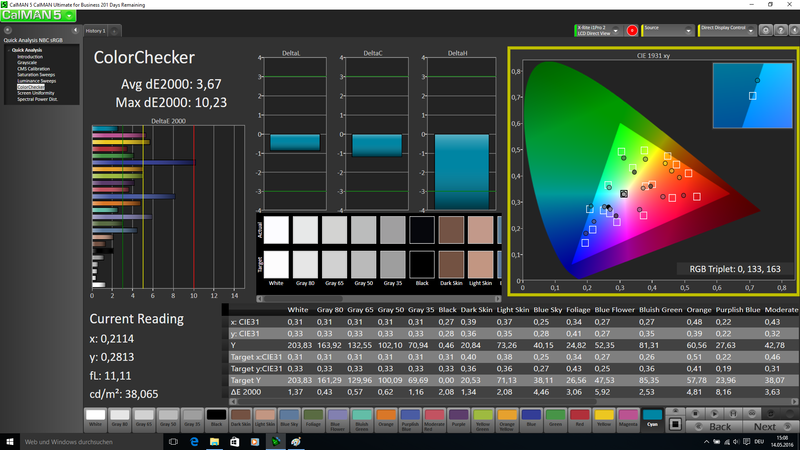 We recommend an external display for professional applications (photographers or graphics artists), because the color-space coverage will not be sufficient (sRGB 57.96%, AdobeRGB 37.46%) for these scenarios. As we mentioned before, there is no other display option for the AsusPro Advanced B8430UA. The matte TN panel can somewhat compensate for the low luminance and is therefore generally suited for use outdoors. Because of the low brightness though, you should look for a place in the shade. The AsusPro Advanced B8430UA does not stand a chance against direct sunlight. 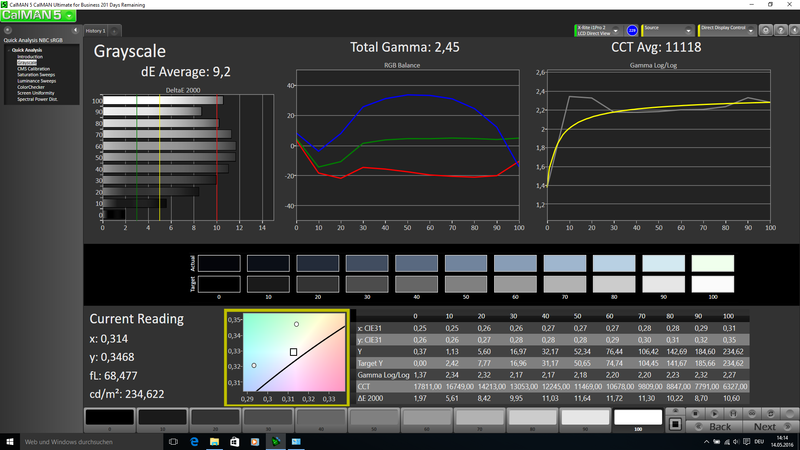 The HP EliteBook 840 G3 is 62% brighter and works much better in this case. Asus advertises the AsusPro Advanced B8430UA with the slogan "Anti-reflective Wide-View-Display". We are a bit skeptical about the term "Wide-View" in combination with a TN panel – and this does not really change with the review unit. This would only be the case with a high-quality and more expensive IPS display. The deviations with vertical changes of the viewing angle in particular are only visible from flat angles. The contrast ratio drops and the colors deviate as well. The AsusPro Advanced B8430UA is a pure business device with a 14-inch screen. The build quality of the individual components is good and the extreme testing procedures by Asus ensure durability. Our review unit is powered by an Intel Core i5-6200U, and there are no other options at the time of writing. It is supported by 8 GB RAM in a dual-channel configuration, so multitasking is no problem. 4 of the 8 GB is soldered onto the motherboard. The slots support up to 16 GB modules, so you can use up to 20 GB RAM in theory. 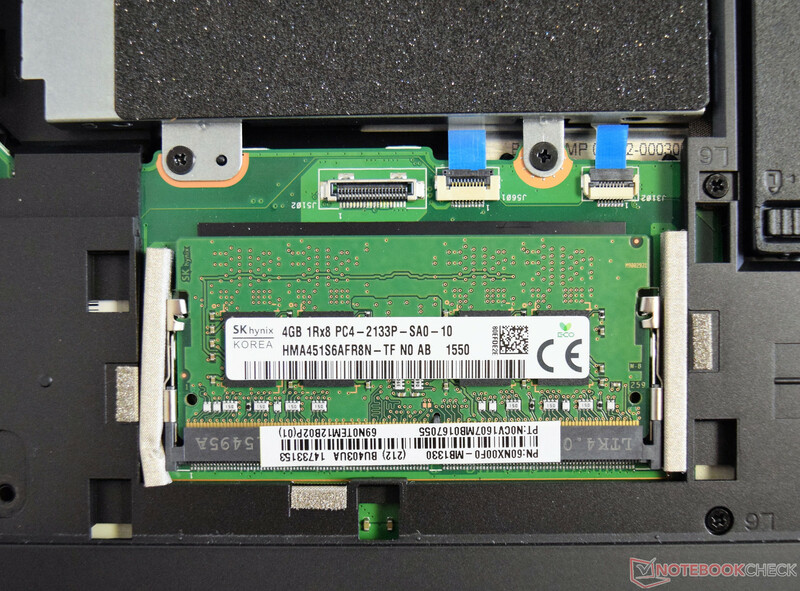 The system drive is a 256 GB M.2-SSD (2280) and there is also a free 2.5-inch slot. The frame, the screws, and the connector cable are included in the box. The performance of the device is more than sufficient for average office applications. The Intel Core i5-6200U is a ULV processor and the performance is sufficient for the most common applications. It is a dual-core chip, which can execute up to four threads simultaneously thanks to Hyper-Threading technology. The chip is based on Intel's Skylake architecture and has a TDP of just 15 Watts, which helps the battery runtimes. The nominal clock of the CPU is 2.3 GHz, which can be increased to 2.8 GHz (1 core) or 2.7 GHz (two cores), respectively, via Turbo Boost. 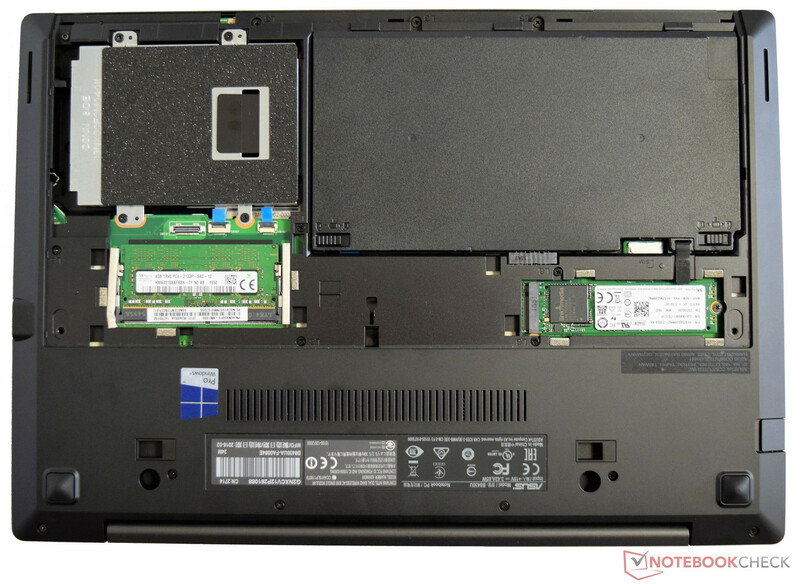 Compared to the Lenovo ThinkPad T460s, the performance of our review unit is a bit lower. 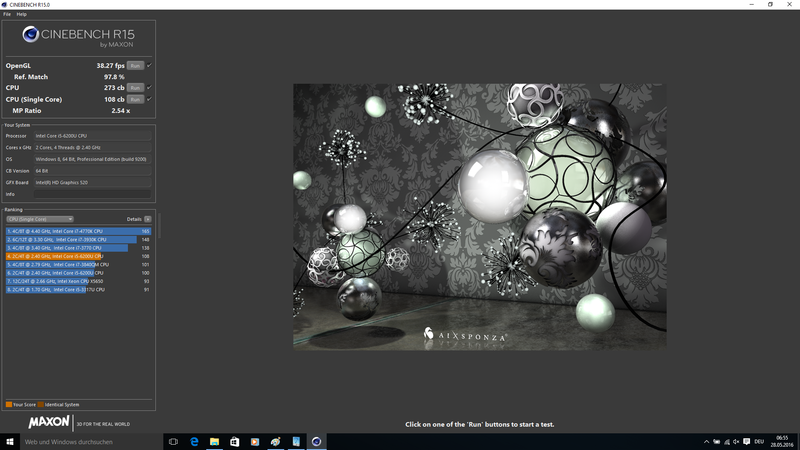 Our Cinebench R15 results show that the AsusPro Advanced B8430UA is beaten by almost all the rivals; only the performance in Cinebench R15 Multi is a bit better. 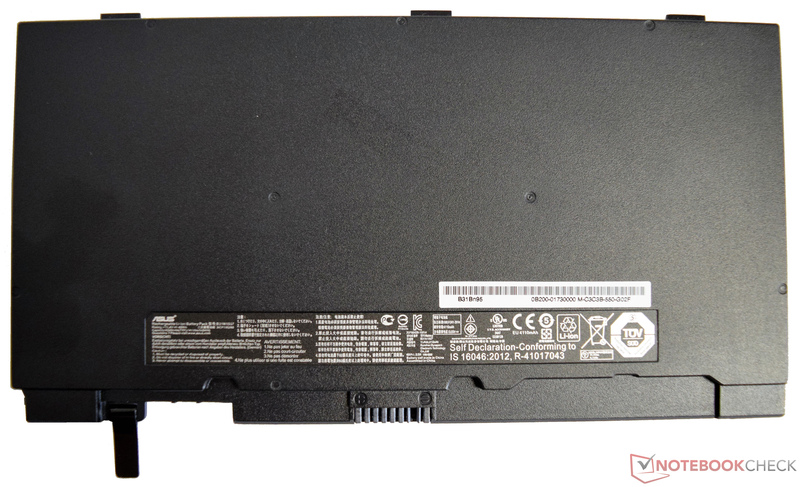 You should, however, consider that the rivals Lenovo ThinkPad L460, Dell Latitude 14 E5470 and HP EliteBook 840 G3 are equipped with more powerful CPUs. 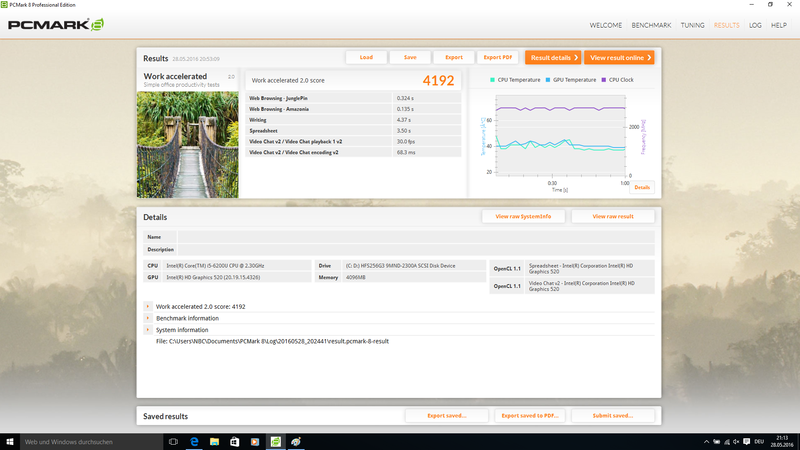 The meager performance utilization of the Intel Core i5-6200U subjectively does not affect the system performance. Thanks to the SSD, the system is responsive and works well in practice. There are no long delays when you launch apps, and the whole configuration is well-balanced. 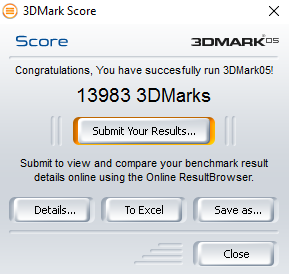 This impression is supported by the impressive PCMark 8 scores. 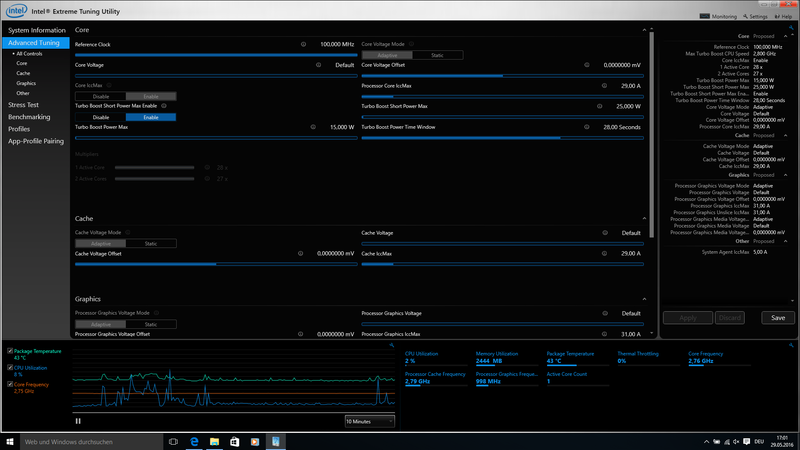 While the AsusPro Advanced B8430UA was last in Cinebench, it can even compete with the Intel Core i7-6500U in this case and sometimes beat it. 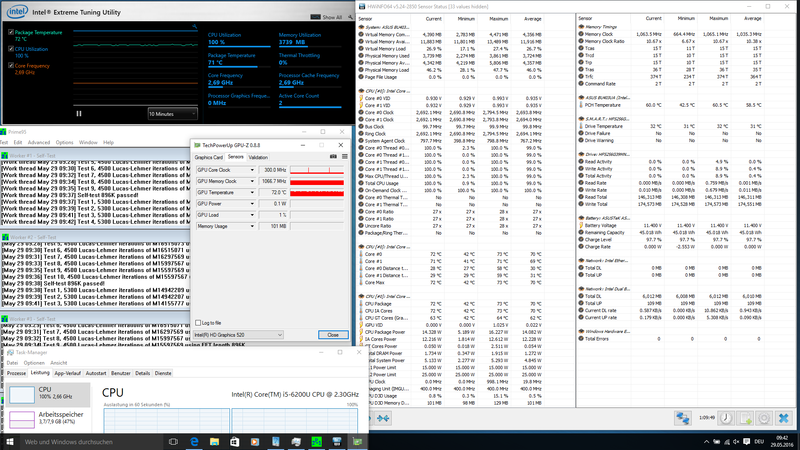 The direct comparison with the Lenovo ThinkPad T460s, which sports the same CPU, shows better results for the Asus. 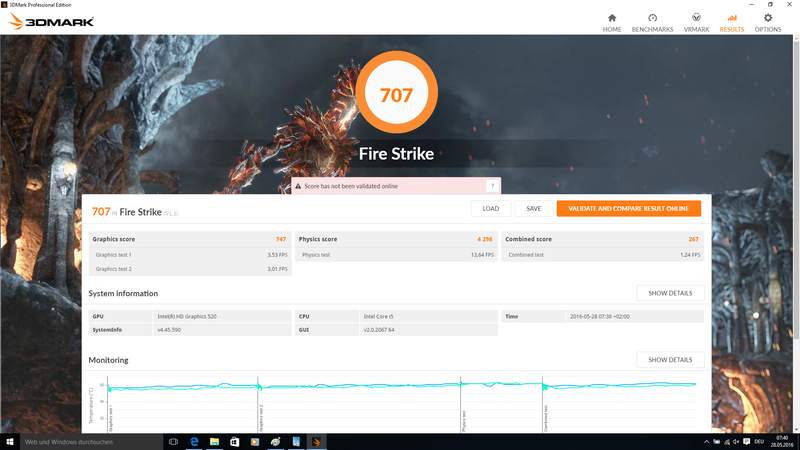 We can see the advancements of the technology when we compare the results with the predecessor AsusPro Advanced BU401LA, because the review model is 25% faster. 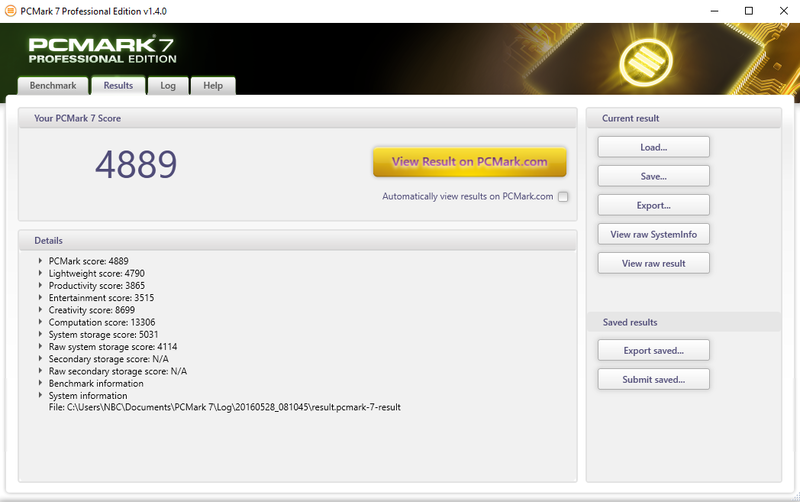 The Dell Latitude 14 E5470 manages the best result in PCMark 8, but our unit is just 5% behind. 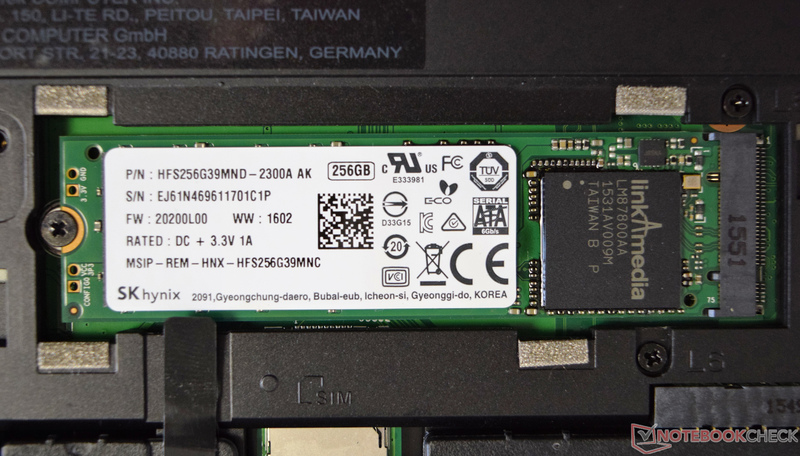 Asus equips our review unit with a 256 GB SSD, but there are two partitions by default. They have a size of 95 and 118 GB, and the smaller part was used for the operating system. We are not sure why the manufacturer partitions the drive when you consider the comparatively small capacity. This means larger applications have to be installed on the 118 GB part. The M.2 drive (2280) is provided by SK Hynix (HFS256G39MND). The transfer rates are 530 MB/S (read) and 370 MB/s (write) according to the spec sheet, but AS SSD determines actual transfer rates of 472 MB/s and 274 MB/s. 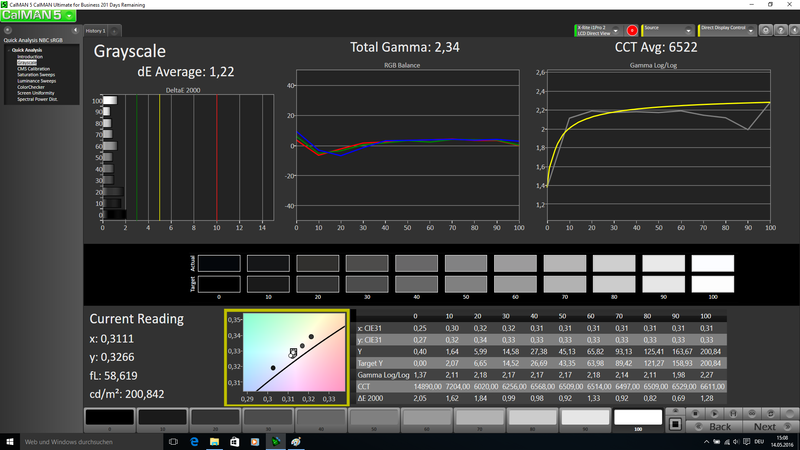 A good result at a first look but still below the theoretical potential. The performance in practice is still okay, and there will not be any noticeable limitations. 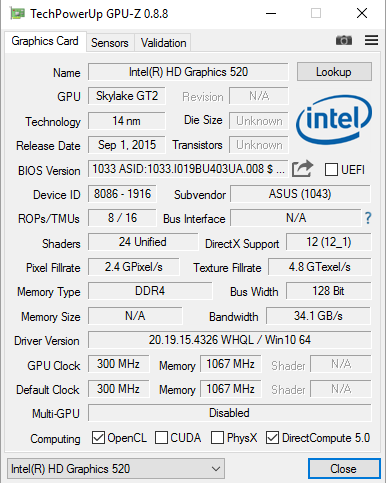 The AsusPro Advanced B8430UA does not have a dedicated GPU, so the graphics are handled exclusively by the integrated Intel HD Graphics 520. It does not have its own VRAM, so the graphics card shares the memory with the processor. 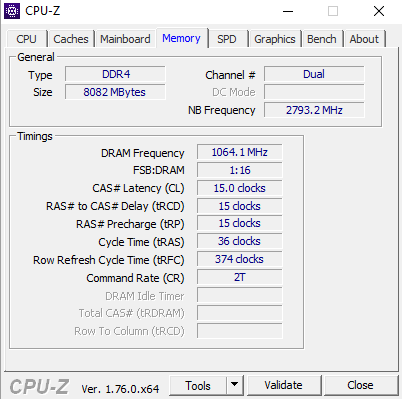 Our review unit is equipped with DDR4-RAM (2133 MHz) in a dual-channel configuration. 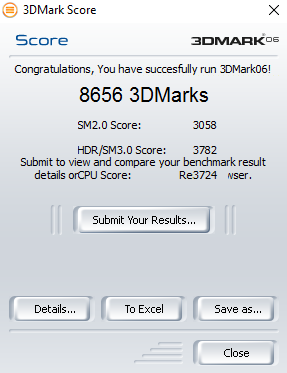 Those are good prerequisites for the performance of the Intel HD Graphics 520. A single-channel memory configuration would affect the graphics performance. 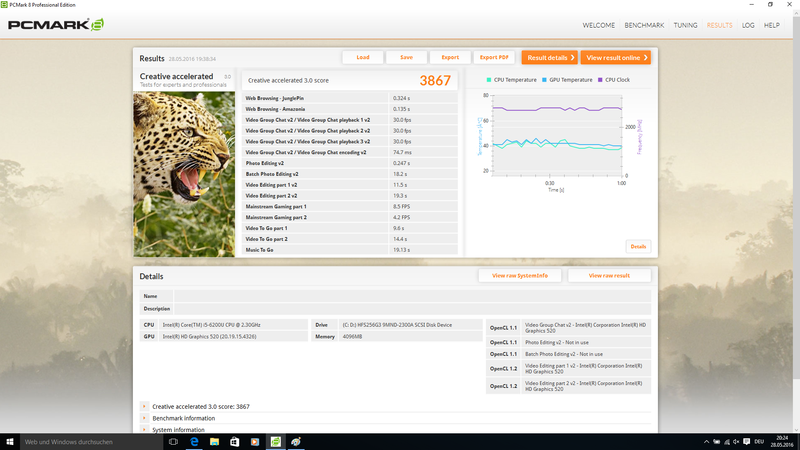 The GPU supports DirectX 12 and can decode modern H.265/HEVC videos without additional load for the CPU. 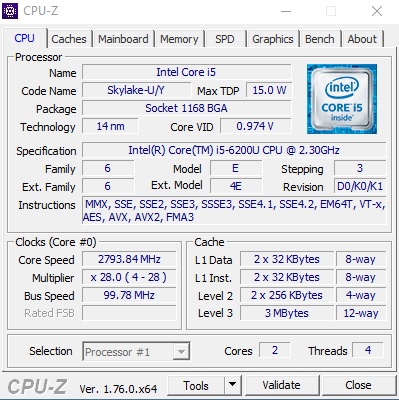 The base clock of the Intel HD Graphics 520 is between 300-1000 MHz. 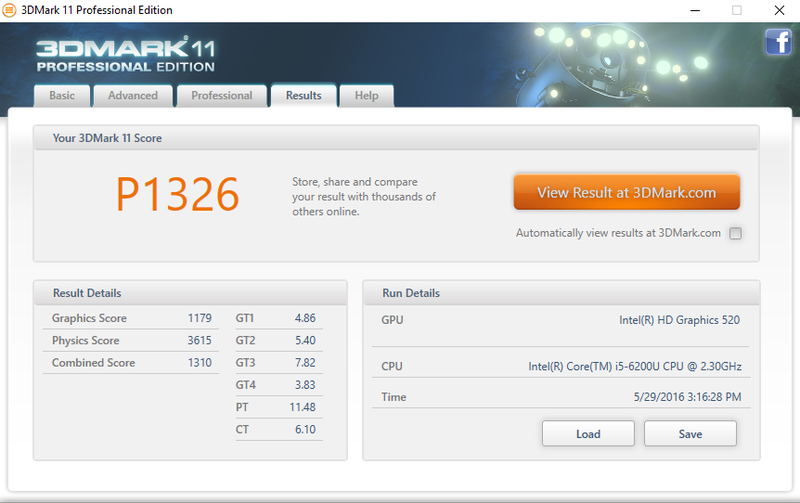 The good system performance is also evident in the 3DMark benchmarks. The performance of the predecessor HD Graphics 5000 was increased by 7% on average. 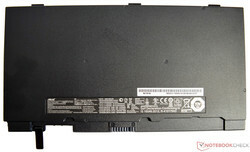 Our model can also beat the similarly equipped Lenovo ThinkPad T460s. 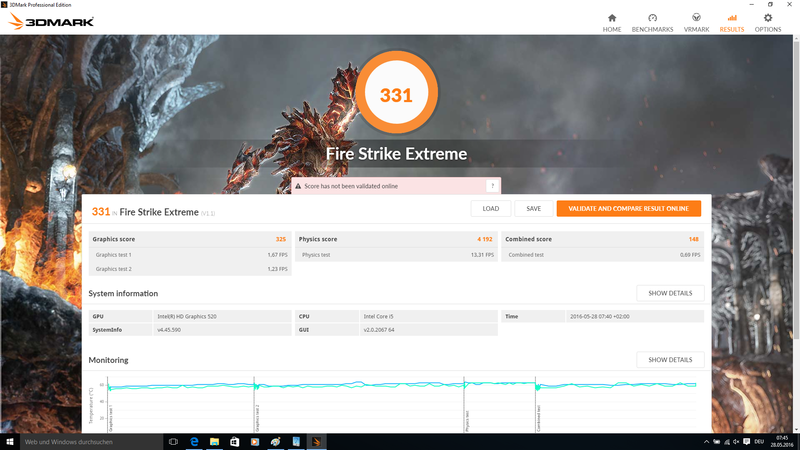 The comparatively good 3DMark results are also confirmed by the gaming benchmarks, but you should still not expect too much, since it is only an integrated graphics solution. You are usually limited to older titles from 2013 or sooner and minimum details in combination with the HD resolution. 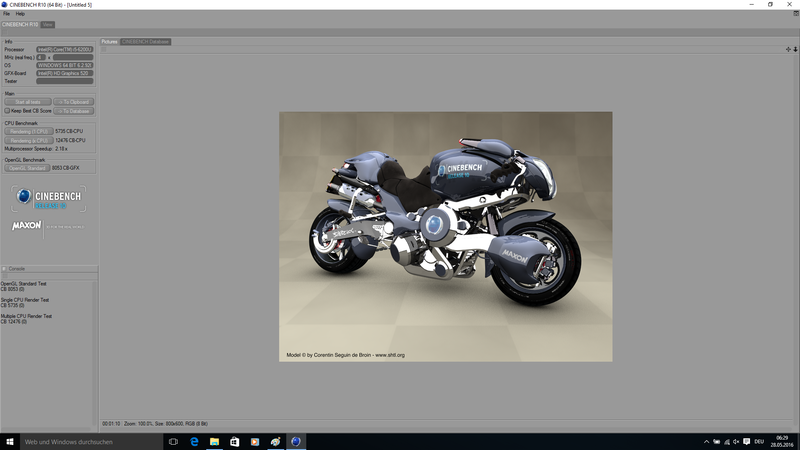 Modern titles are too demanding for the Intel HD Graphics 520. 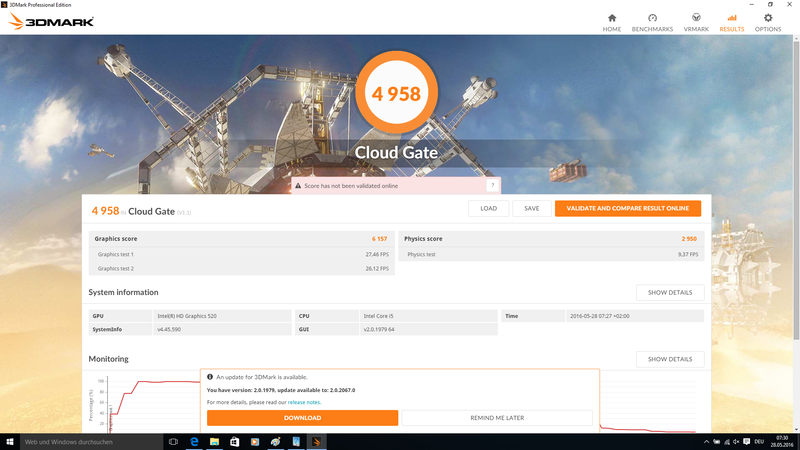 If you need more performance, you have to get a device with a dedicated GPU. 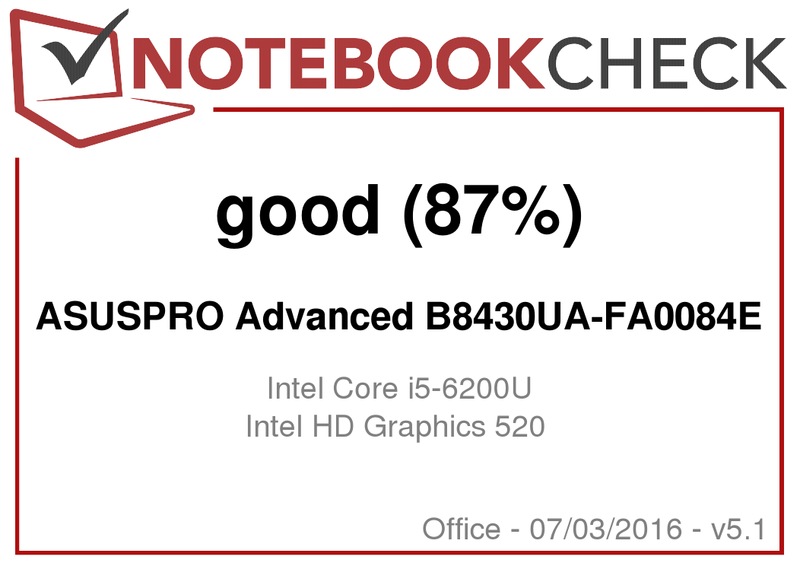 For a business notebook though, the Intel HD Graphics 520 is sufficient. 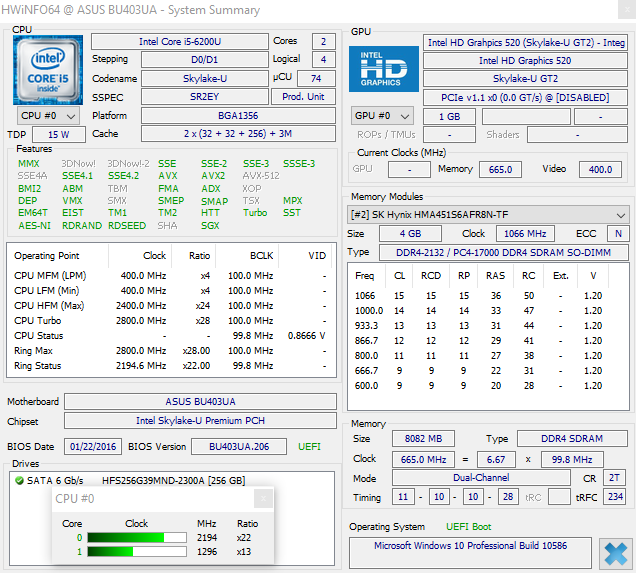 The AsusPro Advanced B8430UA is very restrained while idling, so it is silent. 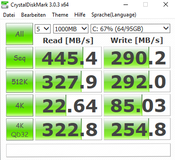 This is also a result of the SSD. The small fan will quickly start spinning under load and is audible. 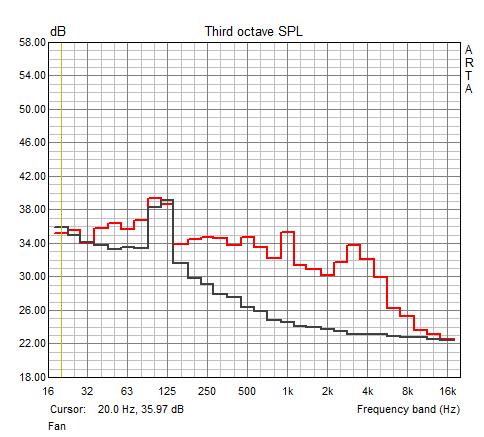 We can measure up to 36.1 dB(A). You can hear the fan, but there are no high-pitched sounds. Almost all the rivals are on par. 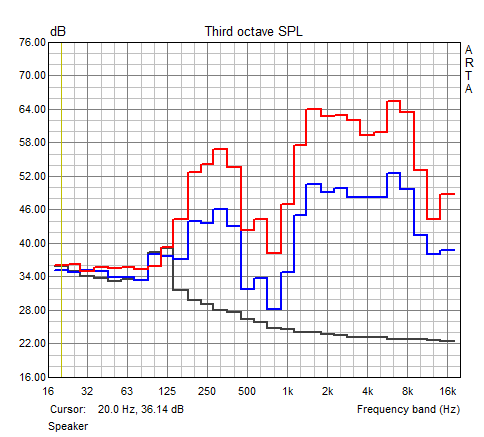 Only the HP EliteBook 840 G3 is sometimes much louder. 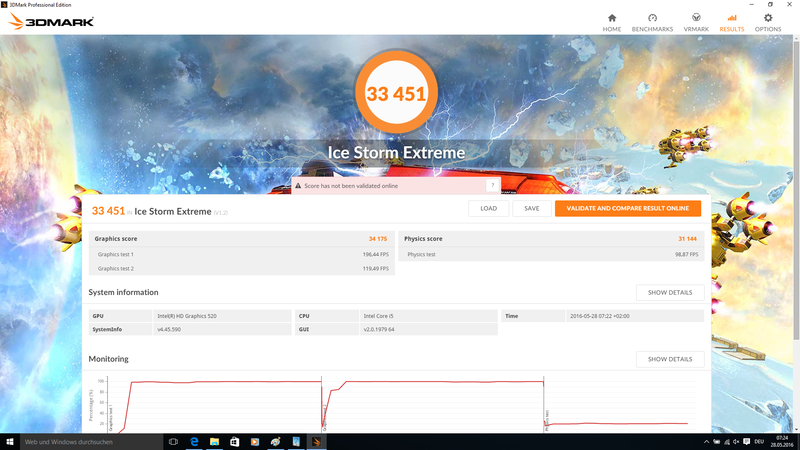 The case of the AsusPro Advanced B8430UA warms up to 33 °C on average. Hotspots at the bottom can reach almost 40 °C and slightly more than 40 °C in the area of the fan exhaust. However, the review unit only gets this warm under maximum load. Those results should be rare in practice, so the temperatures are usually no problem and you can also use the device on your lap. 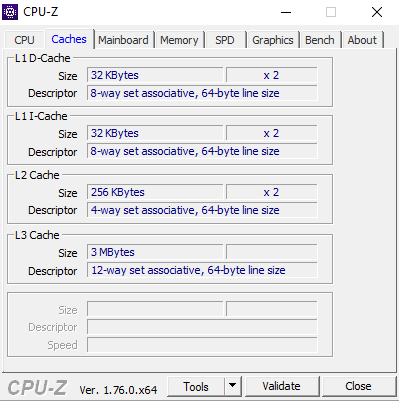 We determine a maximum CPU temperature of 73 °C with the tool Prime95, and the processor can maintain a clock of 2.7 GHz. 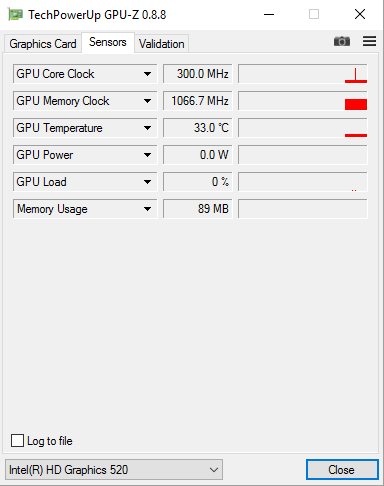 The GPU reaches up to 68 °C with FurMark. The clock is usually 850 MHz and occasionally increased by 50 MHz to 900 MHz. The ULV processor from Intel only has a TDP of 15 Watts for the CPU and the GPU. 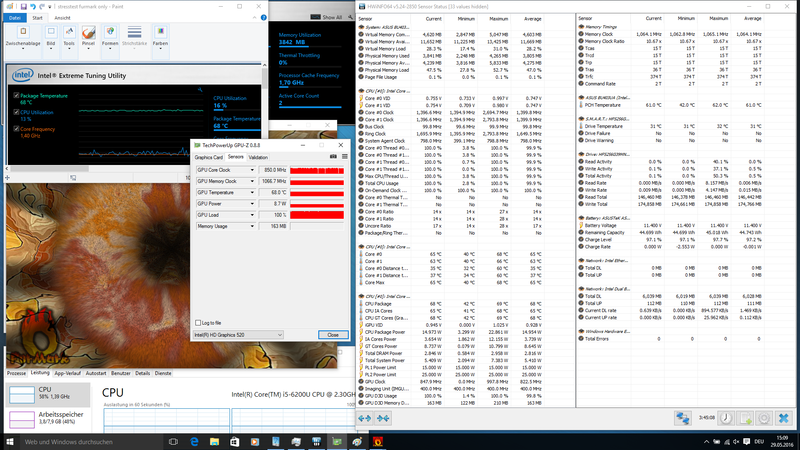 This limits the performance during our stress test with the tools Prime95 and FurMark for at least one hour. 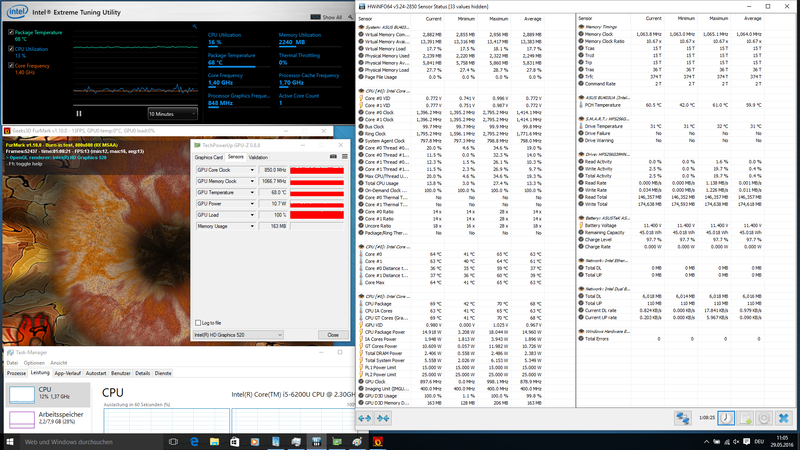 The CPU only runs with 1.4 GHz from the beginning and the temperature is slightly below the maximum at 68 °C. 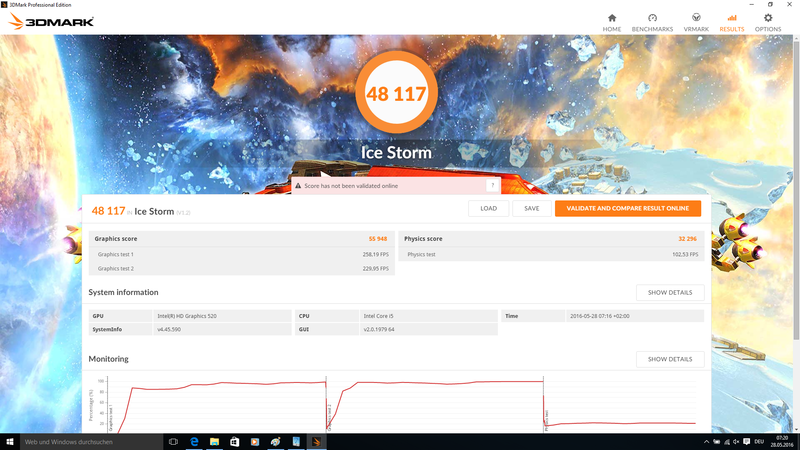 We noticed that the GPU frequency varied between 800-850 MHz. The behavior in the stress test is the same on mains as well as battery power. 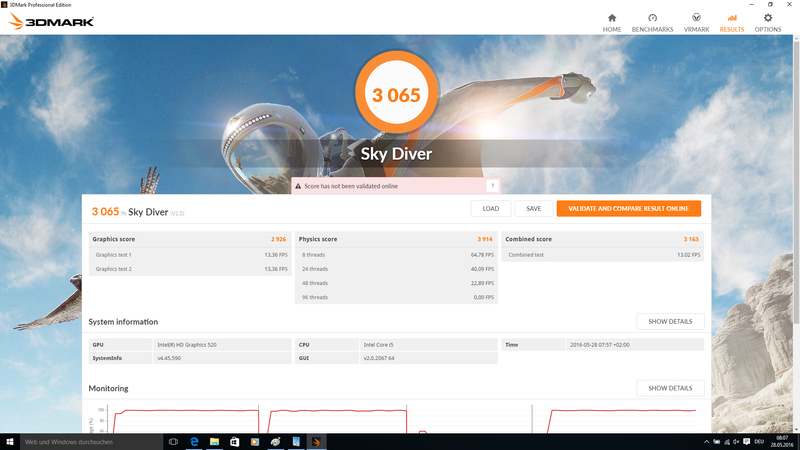 We repeated 3DMark 11 immediately after the stress test and determined 1326 points, which is 7 % less compared to a cold start. 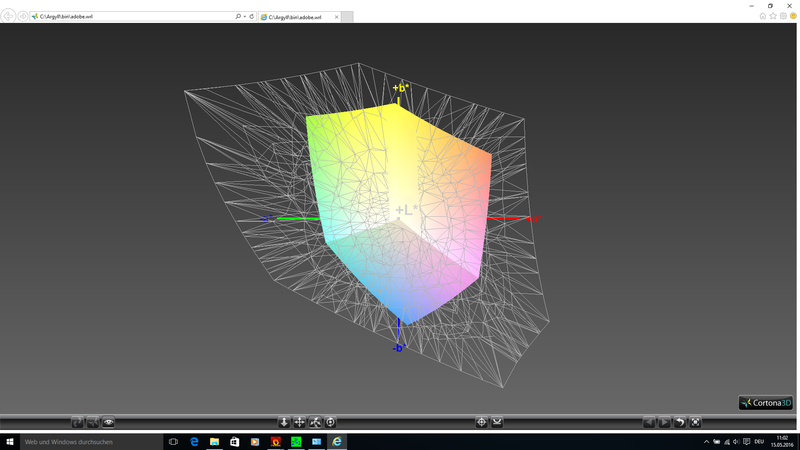 This small disadvantage should not be an issue in practice though, because this device was not designed for 3D applications. 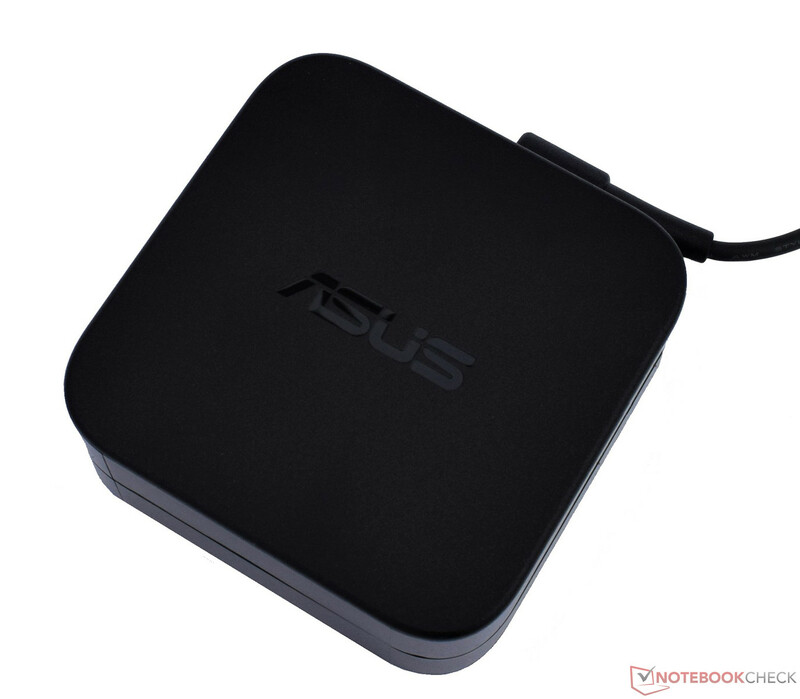 Asus implements two small stereo speakers, which are located at the sides of the bottom panel. Similar to many other business devices, the quality is pretty average and sufficient for video calls. There is an emphasis on the high tones, but medium tones and bass are almost lacking completely. The sound also gets distorted when you crank it up. You can obviously watch videos or listen to music with the device, but we recommend a headset or external speakers for a better quality. 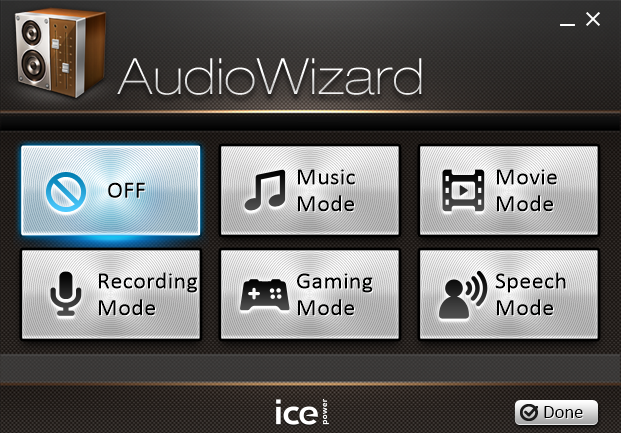 The tool AudioWizard provides several presets for different scenarios. The Skylake-ULV processor slightly reduces the idle power consumption. The AsusPro Advanced B8430UA can consume up to 41 Watts for a short while, which is much more compared to the predecessor. Only the Lenovo ThinkPad L460 is even worse at 57 Watts, but this is a result of the dedicated GPU. All the comparison devices are pretty similar on average and the differences are small. 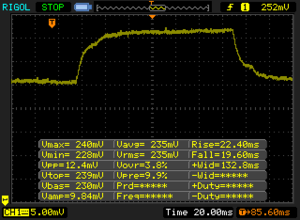 We have to criticize the consumption of 0.35 Watts when the AsusPro Advanced B8430UA is turned off though. Both the predecessor as well as the Dell Latitude 14 E5470 show that it does not have to be like this. 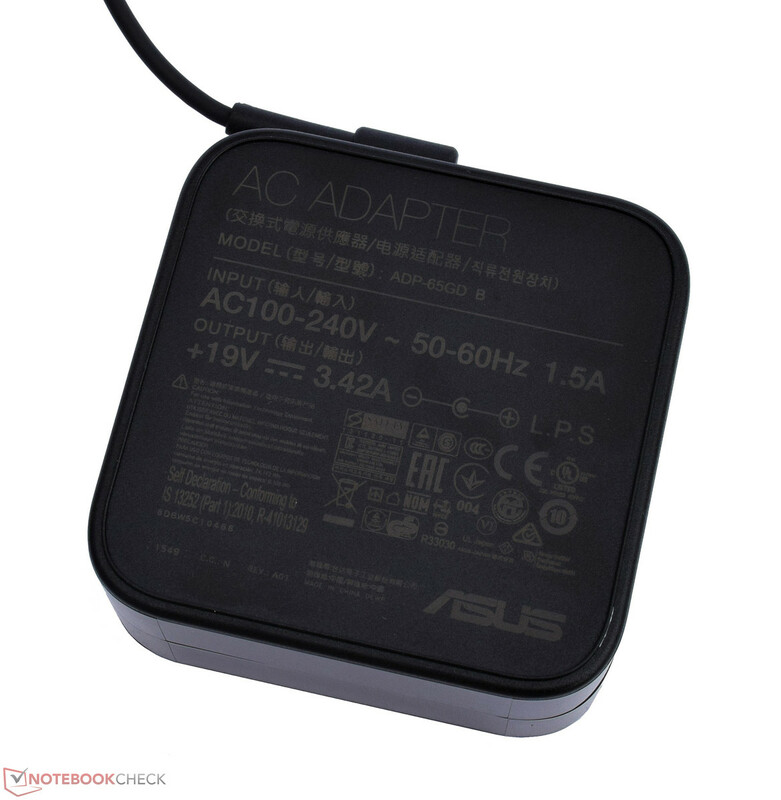 The 65-Watt power adapter is sufficient and has enough headroom to charge the device under load. The battery capacity was slightly decreased compared to the predecessor and we now get 48 Wh. 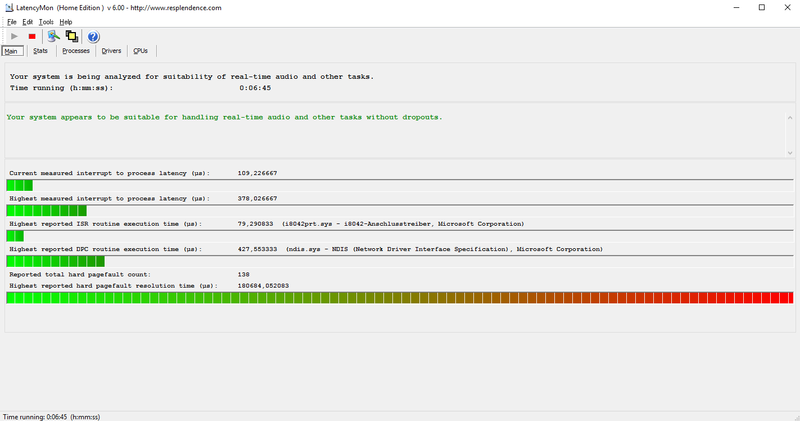 The new AsusPro Advanced B8430UA still manages better runtimes than the old model. 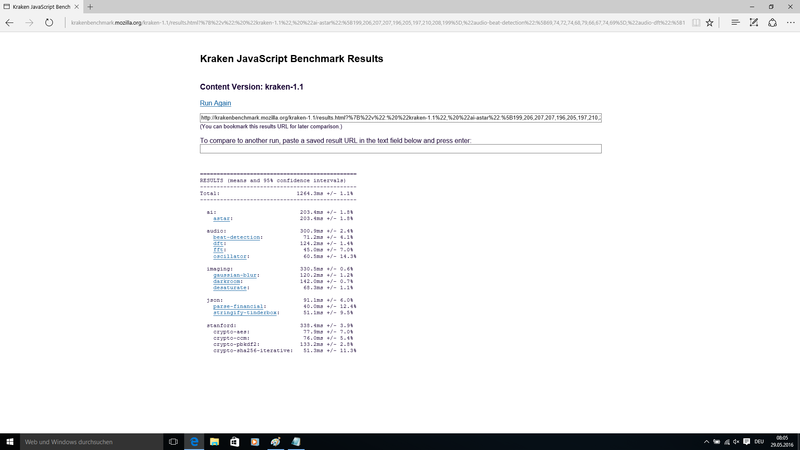 The frugal ULV processor ensures a runtime of at least 2:09 hours, and the device lasts for 5:44 hours in our WLAN test, where a script opens a new website every 30 seconds. 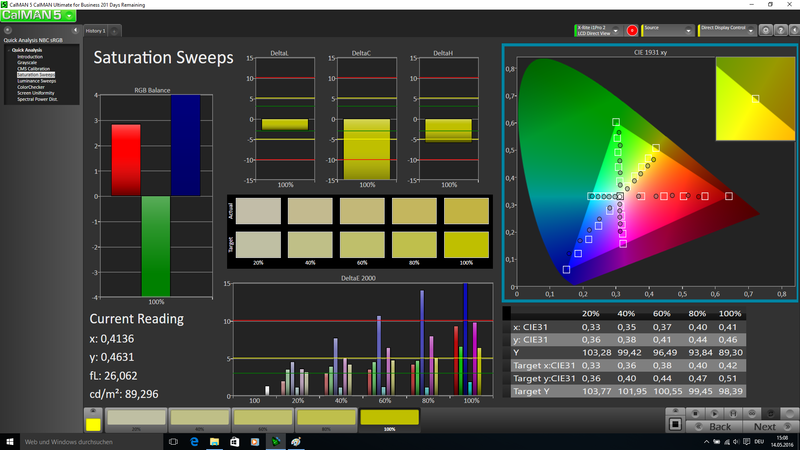 The luminance is adjusted to 150 nits (- 2 brightness levels for our review unit) and we use the “Balanced” power profile. 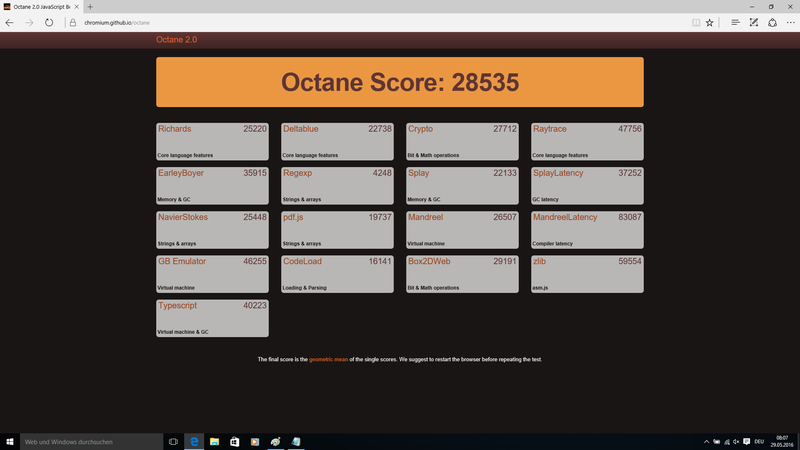 This result is beaten by all the rivals except for the old AsusPro Advanced BU401LA and the Lenovo ThinkPad T460, but the device from Dell also has a bigger battery capacity of 62 Wh. 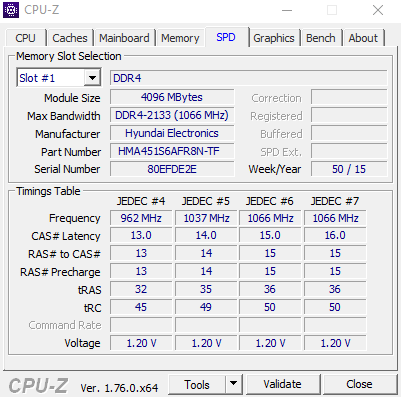 In review: AsusPro Advanced B8430UA. Test model courtesy of Notebooksbilliger. 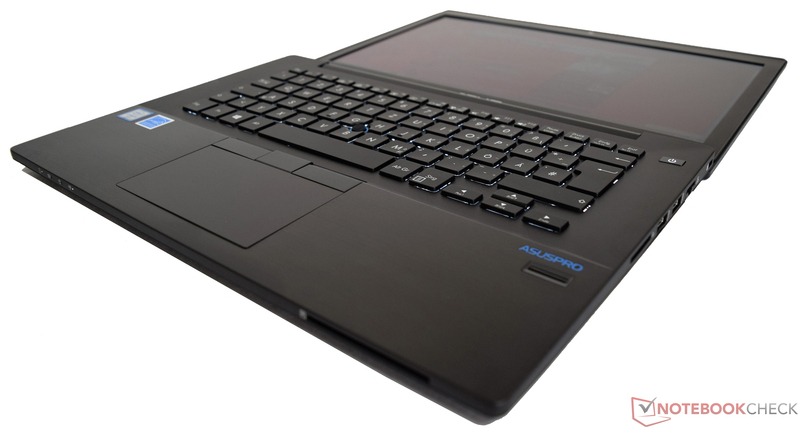 The AsusPro Advanced B8430UA is a good and enduring 14-inch business notebook. Thanks to the modern components, the performance was noticeably increased compared to the predecessor. The low weight ensures decent mobility and the price of less than 1,000 Euros (~$1128) is certainly tempting. 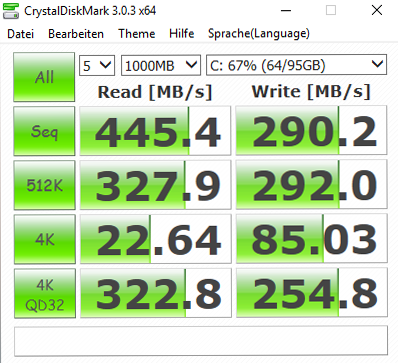 The good system performance is an important aspect when you use the device every day, so the SSD as a system drive makes a lot of sense since it has the biggest effect on the subjective performance impression. The sturdy and inconspicuous chassis accommodates a balanced configuration of components – all for an attractive price below 1,000 Euros (~$1128). We are a bit disappointed by the display, which manages decent viewing angles despite the TN technology, but it cannot meet our expectations in terms of luminance. The small stereo speakers cannot convince us, either. The performance of the review unit is not sufficient for modern 3D games, but this is not necessary for the target group. If you do not want to waive gaming, you have to get a notebook with a dedicated GPU. We liked the good input devices, which are crucial for an office device, as well as the good battery runtimes. The AsusPro Advanced is a worthy successor to the AsusPro Advanced BU401LA.